In Fiery Interview With British Tabloid, Trump Criticizes Prime Minister, London Mayor Speaking with The Sun, the president said that Theresa May ignored his advice on Brexit and that it could kill the prospects for a U.S.-U.K. trade deal. 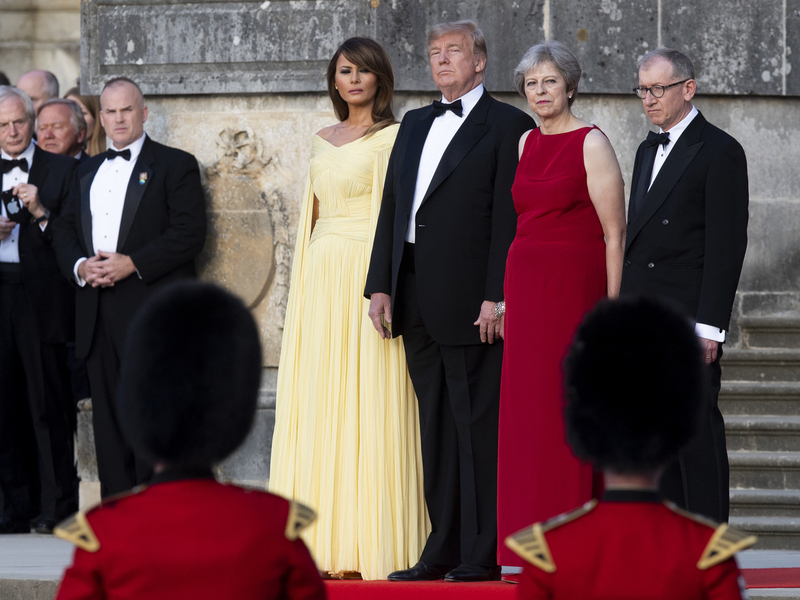 U.S. first lady Melania Trump, President Trump, British Prime Minister Theresa May and her husband, Philip May, watch a military performance ahead of a dinner in Oxfordshire, U.K., on Thursday. Fresh from a contentious meeting with NATO leaders in Brussels in which he demanded member nations contribute more for their collective defense, Trump made a number of incendiary remarks to the British tabloid that are sure to provide fodder for his critics in the U.K. and Europe. In the interview, which took place at the U.S. Embassy in Brussels, the president also lashed out at the mayor of London, saying he had done "a terrible job." Trump also said that immigrants were destroying European culture and that he planned to maintain good relations with Russian President Vladimir Putin despite nerve agent attacks on U.K. soil that have been blamed on the Kremlin. Concerning Brexit, Trump said, "I would have done it much differently. I actually told Theresa May how to do it, but she didn't agree; she didn't listen to me." Instead, he said, May went "the opposite way" and the results have been "very unfortunate." Trump also said the deal that May's government has proposed would "probably kill" any trade agreement with the U.S. because Washington "would be dealing with the European Union" instead of with the U.K. However, just before their meeting at May's country home, Chequers, both leaders emphasized to reporters the "special relationship" between the U.S. and U.K.
May called the relationship "great" and said the two would be discussing the "real opportunity" for a "fantastic trade deal coming up when we leave the European Union," as well as foreign policy, defense and security issues that both countries work closely on. "The United States is our longest-standing and deepest security and defense partner," she said, adding that Trump did a "very good job" at NATO in encouraging others to meet their defense spending commitments. Britain's exit from the European Union, which was approved in a 2016 referendum, has been a complicated divorce, and the U.K. has opted for a "soft Brexit" that includes maintaining some ties to the EU. 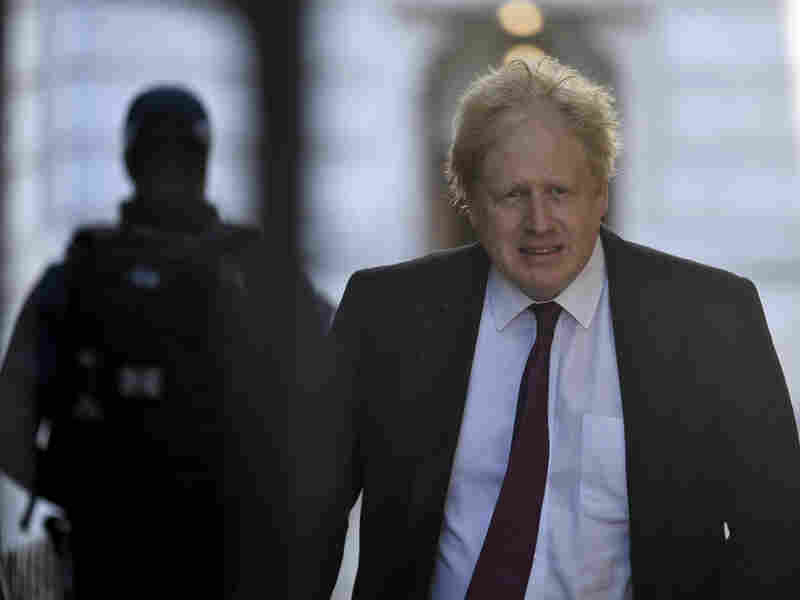 However, that has angered hard-liners in May's Cabinet and prompted high-level resignations in the past week, including the departure of Foreign Secretary Boris Johnson, whom Trump called "a very talented guy." Boris Johnson, who resigned as Britain's foreign secretary this week, was praised by President Trump in an interview. The president told The Sun that while he is in the U.K., he would like to see Johnson, who, "obviously likes me and says very good things about me." "I was very saddened to see he was leaving government and I hope he goes back in at some point. I think he is a great representative for your country," Trump told the newspaper. On immigration, Trump said, "Allowing the immigration to take place in Europe is a shame." "I think it changed the fabric of Europe, and unless you act very quickly, it's never going to be what it was and I don't mean that in a positive way," the president said. "So I think allowing millions and millions of people to come into Europe is very, very sad," he said. "I think you are losing your culture. Look around. You go through certain areas that didn't exist 10 or 15 years ago." The president slammed London Mayor Sadiq Khan on terrorism and crime in the city. 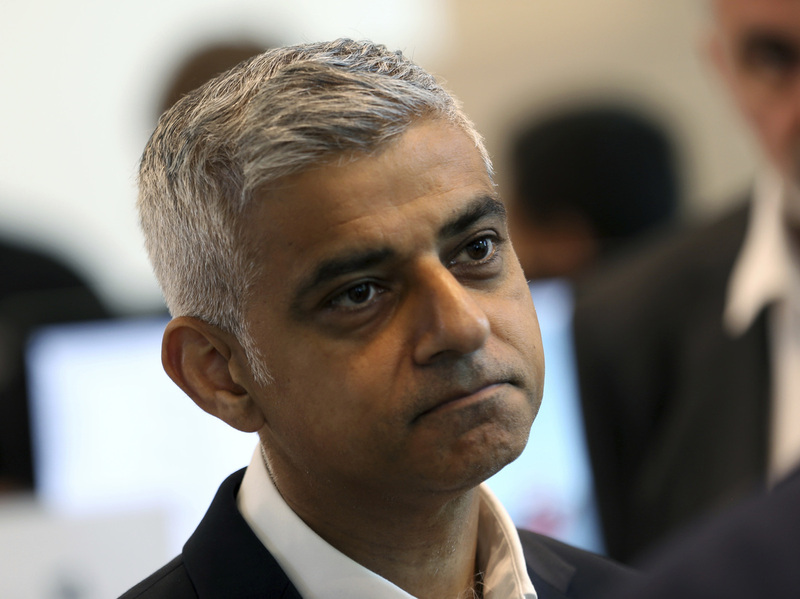 The president slammed Sadiq Khan, the mayor of London, a city that has been the target of several terrorist attacks in recent years: "I look at cities in Europe, and I can be specific if you'd like. You have a mayor who has done a terrible job in London." "Take a look at the terrorism that is taking place. Look at what is going on in London. I think he has done a very bad job on terrorism," he said. "I think he has done a bad job on crime, if you look, all of the horrible things going on there, with all of the crime that is being brought in." According to statistics from earlier this year, London's homicide rate now rivals New York's. In one month, February 2018, there were 15 homicides in London compared with 14 in New York, according to data gathered by London's Metropolitan Police Service and the New York Police Department, respectively, as reported by The Times of London. However, as the BBC noted, the previous month showed eight homicides in London compared with 18 in New York. Further, for all of 2017, the homicide rate per 100,000 population was 1.2 for London, compared with 3.4 for New York. "The idea that you can blame this on immigration from Africa is, I think, preposterous, and we should call him out when he does so," Khan told BBC radio on Friday. A 20-foot-high cartoon baby blimp of President Trump is flown in protest of his visit Friday in Parliament Square in London. 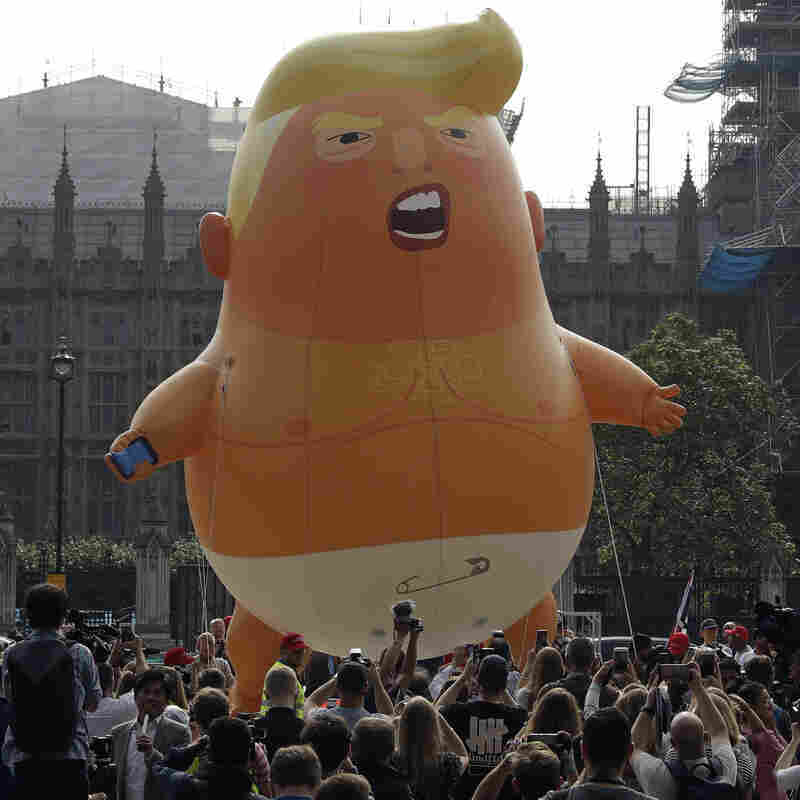 The president suggested that his dispute with Khan might be partly personal, with the mayor having shown disrespect to him by allowing a 20-foot "Trump Baby" balloon — an orange likeness of Trump wearing a diaper — to fly over London protests during the president's visit. "I used to love London as a city," Trump said. "I haven't been there in a long time. But when they make you feel unwelcome, why would I stay there?" he said. "I guess when they put out blimps to make me feel unwelcome, no reason for me to go to London." Khan, in an interview with NPR's Mary Louise Kelly, says Trump is "entitled to have his views." "I'm not going to rise to the individual things President Trump says," Khan tells Mary Louise in London. "I hope during the course of his visit, he sees a city and a country very comfortable with ourselves, very comfortable with our diversity, seeing it as something we should celebrate and not be scared of." Responding specifically to the protest blimp, Khan says, "One thing we should be really proud of, both Americans and Brits, is the rights to protest and express our views. And the key thing is it should be done in a peaceful manner, it should be good-spirited."